Thankfully, the tedium was broken by a few bends in the road (hooray!) 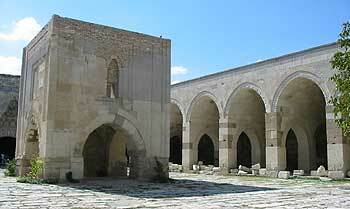 which eventually led to our next stop of the day, the Caravanserai at Sultanhani on the road to Aksaray. The caravansary (to use the English term) was built in the 13th century and provided free lodging, stables and food to merchants heading along the Silk Road. As a result of this, commerce flourished under the Seljuk rule. Today, there are no camels in the stable or traders selling their wares, just one man with a hose to tend to the few plants inside, and a prayer mat in the small arched tower that sits in the middle of the courtyard. 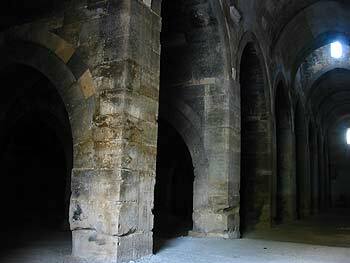 The caravansary is very well preserved, and it's not difficult to imagine how the sight of this would have been a welcome one to weary travellers - well, we had the very same experience! It must have been quite a place when the traders were in town and the impromptu markets were buzzing with people, selling their wares. Final leg - and a giraffe-sized leg it was too. Plenty of opportunity to witness first hand just how strong the Turkish belief in Kismet (luck) and Kadur (fate) is. We saw numerous drivers put their faith in Allah as they overtook other vehicles on blind bends. The trouble is the truck drivers also have faith - so much so that almost all trucks in Turkey have the phrase 'Masallah' on the front. And I think I know whose luck would be in, and who would be fated to come worse off in the event of a collision. As we arrived in the area of Cappadocia, we got our first sight of the strangely eroded valleys that have made the region so famous. We drove past towns in which 'modern' buildings nestled in amongst the ancient natural cone-shaped rocky formations which had themselves been carved out as lodgings hundreds of years ago. It was a strange mixture of squared edges set against the cone-shaped natural formations. We stayed in the Hotel Surban, which itself backs on to a carved-out rock facade. The hotel looked to be bomb-proof - big thick concrete walls and arched roofs and alleyways throughout. One of the most interesting hotels we had stayed in (and were likely to ever again, in all probability). Having got ourselves settled in, Manda and I took a walk in to town along a road that would normally warrant a sign warning drivers to stay in a low gear - this was steep! We passed Jeff, Louise and Belinda walking, I mean struggling, back up the hill. "It's not so easy on the way back up!" Jeff said, which we later found out to be entirely true. We ate in a restaurant that overlooked the centre of Ürgüp. The surprise was just how much traffic we could see going past under our noses. It was incessant. Where was it all coming from? Ürgüp only had a population of 15,000 - not quite a one-horse town, but not far off. We could only assume that this was through traffic. Either that or the locals enjoyed going round in circles - I swear I saw the same bus about three times during the meal. 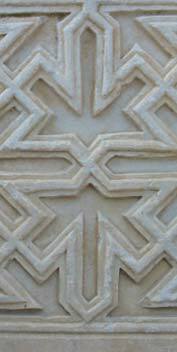 Detail of stone-work at the Sultanhani caravansaray.